Use this versatile TropiShade steel umbrella base to keep your patio umbrella firmly in place. 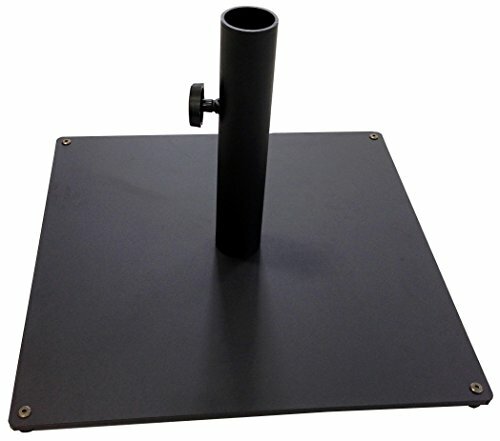 This heavy duty square umbrella base has a weather-resistant design, so you can keep it outdoors all year round. It can fit most of outdoor furniture's because it's less than 1" thickness and fit under table easily. The unit's screw mechanism keeps your umbrella securely attached to the base even in a windy conditions. Fit all kinds of umbrellas including tropishade umbrellas. 20" * 20" square size to increase the base stability. Base weight 36 lbs. If you have any questions about this product by Tropishade, contact us by completing and submitting the form below. If you are looking for a specif part number, please include it with your message.